Three generations of Gelberg women, from left to right: Terri,, Haley & Nadine. Hot on the heels of the fast-growing "athleisure" fashion trend, locally made activewear brand Devigi launched online in 2013 before opening its first retail location at company headquarters in Wyndmoor just last month. 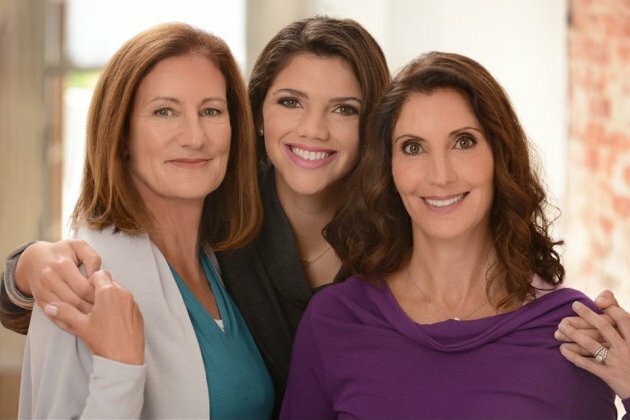 Devigi is run by three generations of women: founder Nadine Gelberg, her mother, Terri, and her daughter Haley. But its matriarchal foundations are not all that makes the brand special. Everything in the Devigi brand is designed and manufactured right here in Philadelphia. Even the textiles were made here; Nadine, who holds a doctorate in sport technology, created the line's athlete-friendly, breathable fabrics. It's easy to see that the line was made with three generations in mind, too, as Devigi is careful to temper flashy design trends with silhouettes that flatter all ages and body types. Nadine told PhillyVoice all about running a family business and her crazy workout playlist. What’s the craziest part about working with your family? We work as a team where our time, effort and energy is integrated with our commitment to each other and our family dream. Everyone in the family is engaged with business issues and really cares about fabric choices, pattern creation, marketing plans and sales strategies. There is a heart to our operations in way that is different from a regular job. Unlike other jobs, meetings can include both tears and hugs without human resource intervention. In a family business, managing, mentoring and parenting are all intertwined. Family businesses are crazy because there are no days off or conversations that are “just business.” This enthusiasm, intensity and heart which may be crazy at times is overall energizing and essential to the enthusiasm necessary to pursue a dream. My workouts vary not only to engage different muscle groups but also to maintain enthusiasm and commitment. At my age, daily cardio is critical and I motivate by creating goals and targets such as hitting heart-rate numbers, running speed, changing distances or adding interval intensity. I find working out with others encourages me to push my own limits and try new activities. I try to find ways to make workouts fun instead chores that must be accomplished. What does your workout playlist consist of? You have no idea how embarrassing this question is! Since college my number one inspirational song has been “Devil Went Down to Georgia” by The Charlie Daniels Band. My eclectic running repertoire includes Geroge Thorogood, Miranda Lambert, AC/DC, Rodney Atkins, Aretha Franklin, Diana Ross, Jason Aldean -- really any song with a beat and fun lyrics. Where is your favorite place to hang out in the Philly area? Forbidden Drive is a city gem and ideal for walking dogs, hiking, running and biking. It is a great place to hang with others or find private space to think philosophically. After visiting many cities, I come back and appreciate how special it is to have the miles of hiking and biking trails through the woods that Philly has. Even more valuable, after putting a wet dog or muddy bike into the car, I am grateful that this gem is within walking distance. Whenever people asked me in grammar school what I wanted to be I would say, “a zoning litigation attorney.” Zoning, because I did not want the pressure of criminal law and the responsibility for someone’s life, but litigation because arguing in the courtroom seemed fun and energizing. I learned, however, that all attorneys had to review documents in detail most of the day and it did not seem as much fun as I had imagined. Helping people feel good and look good so they are energized to workout is my true passion and I am lucky to spend my day with family and inspiring customers.